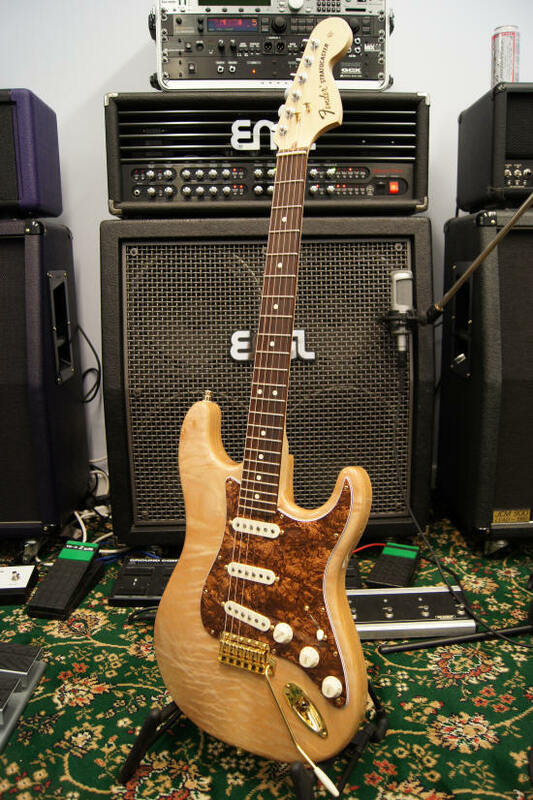 Fender Custom guitar Review called the 'worlds best Fender stratocaster' on YouTube which I made in 2011 mainly from Fender Stratocaster parts and a Warmoth body. STOP - before you write this off as some copy guitar check it out as this stratocaster has been viewed and seen over 1,300,000 times on YouTube! and counting. This is a guitar that I rebuilt from the ground up basically. It started out as a different guitar and then progressed to what you see below. Somewhat of a change for the better I believe. This guitar when I first built it was fine, it had a good sound and I incorporated many different components to get that '69' tone including the Ybarra pickups from Fender custom shop. The sound was ok and the neck feel was great, but this was a very heavy guitar and as I get older those sort of things take their toll on me - the previous incarnation was over 9 Lbs. if I remember correctly - rather heavy for a Stratocaster style guitar. So I decided to purchase another body from Warmoth because I have had some before and the quality was exceptional. This time I wanted a Stratocaster that would sound awesome, look good and not break the bank so to speak. I reviewed this body on this website check it out from the top menu. But we're reviewing the results of all the work here in this review with a slightly different angle on the guitar. Bear in mind that I already had a working guitar so that 'upgrade' had better be worthwhile, otherwise it's all a bit of a waste of time but as it turned out this guitar went beyond all expectations. No money to be made anywhere there then! So the real cost of this work (excluding my time of course) was about £250 (or $400). Not bad when you consider the change in the guitar as a whole. Time is the one factor that I have not taken in to account when doing all this work. Also bear in mind that I do have the equipment to do the work - you may not. But overall this upgrade took me about three evenings and then about half a day playing around in the studio (not sure if I should count that time :-) ) so it's not a five minute update. Well actually it is (was) not.... you see, I used the neck off the donor guitar which was fine on the other body, but soon realized that the neck pocket profile differed from the neck I had. This made the job actually much harder than it should have been and if that little problem had not existed then this would have been a two night update. Ask yourself what you would do if you had this dilemma? Giving up is not an option! You are probably right... I do get a little fanatical when it all comes down to getting things right - like the shielding shown above. How many guys do you know who do this sort of thing? Probably none. 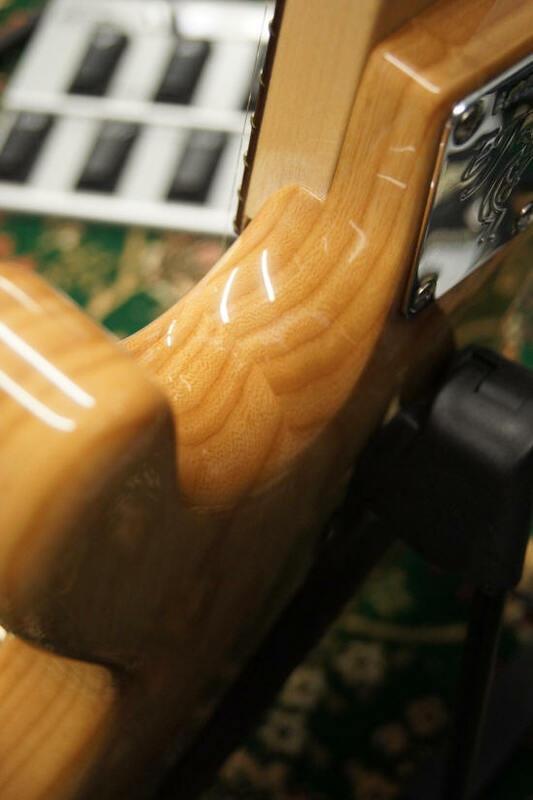 And that's a pity, because this is the sort of detail that can have an everlasting effect on a Fender Stratocaster - whether as here, a replacement body, or indeed one fitted on a Fender stratocaster that you have. If you have those old 'reissue' pickups, or are lucky enough to have some originals then this mod could be for you. You would not believe the difference. Simply put you are creating a 'Faraday cage' which stops other signals from affecting the wiring etc. and the result is substantially reduced hum and interference level. If you think about it for a while, the days when Leo Fender was making those Fender Stratocasters and Telecasters there was far less 'noise' out there. By that I mean less radio signals (and other nasties) that could cause breakthrough of the guitar signal but it was still there - hence the metal plate on the Fender stuff of those days. But hum cancelling? Poor old Leo would have flipped over and gone belly up if he thought that fitting a 'hum bucker' was the answer. And he was right to a large extent. In any case - this is my solution if you use regular single coil pickups. So that's what I did as you can see. Watch it - or I'll break your neck! You see, it's just that I have small hands and they don't like using a real 'mans' guitar. I always remember watching Hendrix at Woodstock and seeing those huge hands and that massive thumb moving up and down the neck. It was then that I realized that I would never be a Jimi Hendrix... when did it dawn on you? Anyway, the cut down heel and extended cutaway is a good idea especially if you are like me - with tiny hands, it will enable me to go where no man has gone before (with a bit of luck). And if not? I'll simply ask Spock why... He has a thing about logic (or was it logistics? quick transport me back in time). Now you come to mention it, I changed the tuners on this guitar for the Fender Locking type. Those original tuners sometimes just let the string go and faster than the tax man wants to be paid, you have a guitar out of tune. So I decided to upgrade those while I was at it. I did want everything to be gold on this one just to set the scene so to speak, but the $150 (£100) plus shipping made me like brushed effect... and it's likely you would too at a saving of over $90 (£60) before tax. Later I did upgrade to gold. Fender Locking Tuners of the Brushed Finish Type - I like them now. So it's finished, you plug it in, hopefully you have some sound, a little tweaking here ad there and... in this case it's awesome! You might think I would say that but if it was a pile of cr*p then trust me, I would be the first to admit it. Luckily this time it's absolutely spot on, even after various problems along the way (watch the videos). Conclusions - would I do it again? 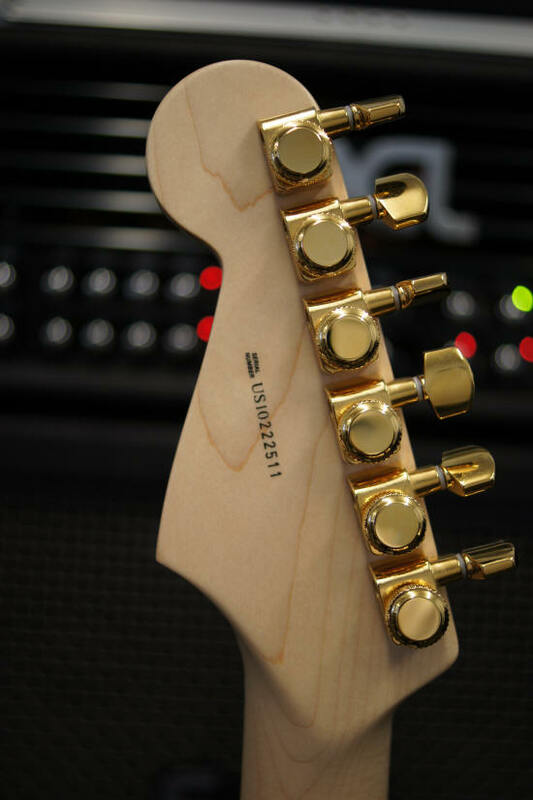 The Warmoth body reduced the weight by two pounds approximately. The David White Pickups sound awesome in almost any stratocaster. The cutaway and neck mods make this thing much easier to play. The Fender Locking Tuners keep this thing in tune. The guitar is really quiet unless spoken to. I rate this guitar now an 8.5 out of 10 and I know that it would undoubtedly cost me much more money if it was hanging on the rails of a Fender dealer. But then again - there's no way I can find one of these on the dealers shelf. 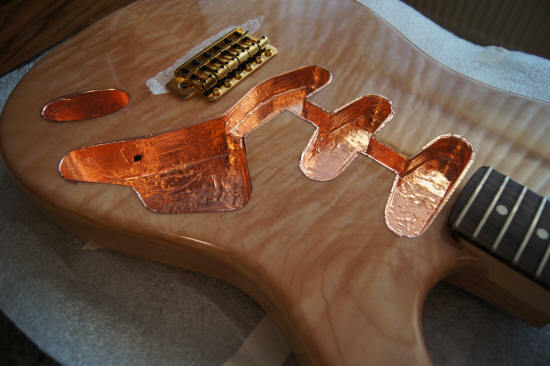 Sometimes some guys think that by fitting a 'non fender' body, or pickups etc. that they are doing the guitar a bit of a disservice and that the second hand value will deteriorate dramatically should you want to sell it. I find that this is often not the case unless you are collecting high value and rare guitars. For the modern musician with an open mind, well I think actually you will be ADDING value to the instrument you have so if you're up to it - go ahead you have nothing to lose and as you can see from these images and video you have a lot to gain. I have been asked about selling this guitar many times so clearly there are many guys out there that also like what they see; for me this one is never going to be for sale.